Image: Dan Dalton/Caiaimage/Getty Images. Design: Kenzie Mastroe/SheKnows. What better way to celebrate Labor Day and all your hard work this year than by shopping some serious sales over the long weekend? Hey, you worked hard for your money. According to U.S. News, September is the best month to save on outdoor and patio furniture, camping gear, appliances, mattresses and clothes — and this year's Labor Day sales absolutely reflect that. 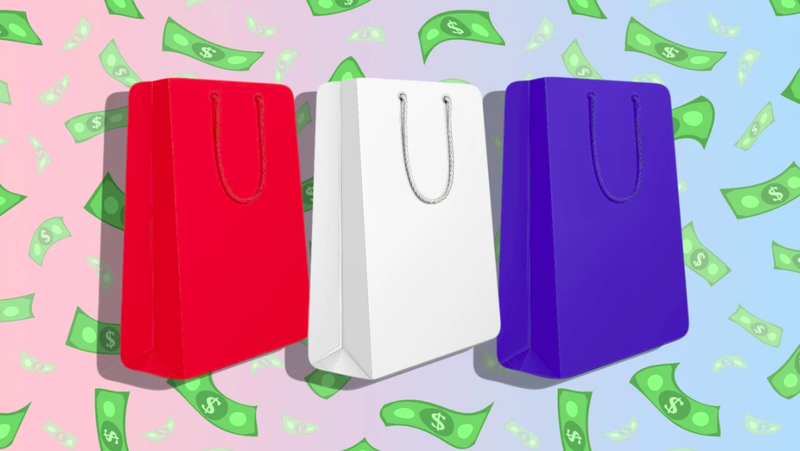 From saving anywhere from 20 to nearly 90 percent on select items on Amazon to scoring some serious deals at Target, JCPenney, Lowe's and more, we've rounded up the best sales going on all weekend. Head to Amazon's Labor Day sales page to click through all the items with some major markdowns, including everything from electronics ($30 off a Fire TV Cube, for instance) to various home goods. Lowe's is helping you save up to 40 percent off appliances (through Sept. 12) and up to 25 percent off DIY project essentials, including select Gladiator garage organization items (through Sept. 19). If you're in the market for new Diamond or KraftMaid custom kitchen cabinets, you can save 20 percent when purchasing $3,500 or more (through Sept. 5). Or, if you've been wanting to paint your walls or furniture, Lowe's offers $10 to $40 off select paint, primer, stain, sealant and resurfaces, also through Sept. 5. Plus, they have markdowns on their outdoor entertaining essentials (up to 75 percent off), including patio furniture, grills and fertilizer. Other items up for grabs for cheap include a BOGO deal on Nest thermostats (through Sept. 3) and up to 30 percent off select Kobalt items through Sept. 5. Order between now and Labor Day, and you'll not only receive $125 off a Nectar mattress, but you'll also get two free Nectar pillows thrown in. To give you an idea of the cost, sale prices range from $375 for twin mattresses to $775 for a California king mattress. Also between now and Labor Day, order a DreamCloud Sleep mattress and get $200 off. Sale prices for DreamCloud mattresses range from $999 for a full to $1,299 for a California king. Beginning Sept. 1, Home Depot is offering deals on everything from smart refrigerators to paint, fertilizer and grills. Deals vary, so be sure to check out Home Depot's sales page. REI Adventures is offering $600 off its Czech Republic Hiking — Vienna to Prague trip. Book it for any 2019 departure date. At JCPenney through Sept. 15, get $10 off your purchase of $50 or more on kids' apparel and accessories. Get the coupon here if you're shopping in-store, or use the coupon code UNIFORM6 if you're shopping online. That's not all, though: If the kids are also due for a cut, head to the JCPenney Salon for $10 kids cuts. First-time online shoppers at Wayfair can save $25 off their order when they enroll in the Wayfair Professional Program. The offer expires Sept. 19. Learn more about the program here. As part of its Outdoor Event, save up to 60 percent on Pottery Barn's outdoor furniture and decor, including umbrellas, outdoor dinnerware and more. Get a $25 gift card when you buy a Cuisinart Airfryer Toaster Oven. Save $49 when you buy both a Google Home Max and a Google Home Mini device, together. Choose a first-aid kit bag free when you buy any select three first-aid health care items. Save $10 on your Target Restock order of $70 or more. Save 15 percent on select items (excluding electronics) using College Order Pickup. Get a $300 gift card available in store with a qualified activation of Google Pixel 2XL. Get a $10 gift card when you buy both a select Philips Norelco OneBlade hybrid rechargeable men's electric shaver or trimmer and a Philips Norelco OneBlade replacement blade (two-count). Save 20 percent on a select helmet or bike accessory item when you buy a select bike, wagon or trike. Get a free Garnier cosmetic bag when you spend $10 on select Maybelline or Garnier makeup items. Save 30 percent on select outdoor play items when you use Order Pickup online. Get $25 off your purchase of $100 or more, either in-store or online. Pier 1's Labor Day sale ends on Saturday, Sept. 1, so act fast. Get up to 55 percent off select items at Nordstrom, including sneakers, backpacks, luggage and more. Over at Travelzoo, you can save up to 65 percent on resorts, B&Bs and more in hot spots across the country, including stays in Chicago, Palm Springs and New York City.